"Socialist Party Presidential candidate Stewart Alexander was the second candidate to issue a response. In the candidate’s email, Alexander remarks, 'The private health insurance companies always had two ideas in mind when it came to healthcare reform – either to avoid all reforms or stick the American people with bad reform. Tonight, the Supreme Court upheld the bad healthcare reform that will insure the profits of private healthcare companies at the expense of American’s access to healthcare....'"
Socialist Party National Co-Chair Billy Wharton was interviewed in the Wild Wild Left Show on July 29 regarding healthcare and the 2012 SP presidential campaign. A recording of the interview can be found here. Socialist Party USA Presidential Candidate Stewart Alexander condemns the removal of the democratically elected President of Paraguay Fernando Lugo. Alexander describes the removal by Congressional impeachment as an illegitimate coup. He calls upon the Paraguayan Congress to restore President Lugo and condemns US President Barack Obama for not strongly denouncing the undemocratic maneuver. "Howie Hawkins of New York and Jill Stein of Lexington, Maine, filed as the Green Party’s candidates; Linda Anderson Boyd of Washington and Ross “Rocky” Anderson of Utah filed as independents; Lex Green of Bloomington and Edward Rutledge of Lemont filed as Libertarians; and Alex Mendoza of Texas and Stewart Alexander of California filed under the Socialist Party USA...."
"I don't know John Strinka. We've never met. But this guy's got guts. Strinka has filed as a Socialist candidate for the Indiana House of Representatives in, of all places, District 39 - a swatch of the northern suburbs that includes parts of Carmel and Fishers. Jerry Torr is the incumbent there. He's an insurance man who voted for what Strinka calls 'Right to Work For Less' during the last legislative session. In a press release, Strinka is touted as the first Socialist candidate in decades to qualify for the Indiana ballot. This is worth thinking about. Indiana, after all, plays a distinguished part in the short and largely forgotten history of socialism in the United States...."
"June 25 was the petition deadline in Illinois for independent candidates, and nominees of unqualified parties. Six presidential candidates submitted a petition: Stewart Alexander, Socialist; Virgil Goode, Constitution; Gary Johnson, Libertarian; Jill Stein, Green; Rocky Anderson, independent; and Michael W. Hawkins, whose party label is “Together Enhancing America.” Hawkins also submitted a petition for himself as an independent presidential candidate. The Libertarian petition actually carries the name of Rex Green, who is a stand-in for Gary Johnson. Illinois law permits substitution...."
Socialist Party 2012 Presidential candidate Stewart Alexander is among the six candidates listed on the Political Compass' official 2012 Presidential Election chart - along with Constitution Party candidate Virgil Goode, (prospective) Democratic Party candidate Barack Obama, Justice Party candidate Rocky Anderson, Libertarian Party candidate Gary Johnson, and (prospective) Republican Party candidate Mitt Romney. 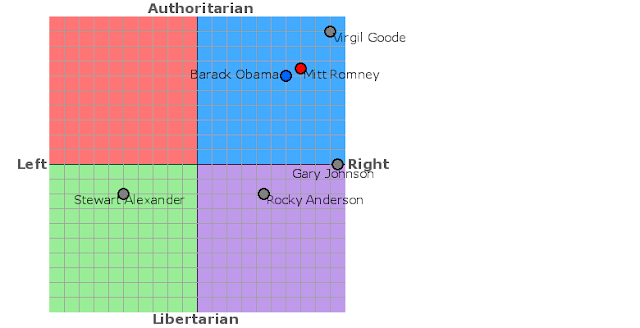 The chart designates Alexander to be the only one of those candidates truly falling on the left-wing of the political spectrum, while also listing him to be tied with Rocky Anderson as the two most socially-libertarian presidential candidates among the six. "INDIANAPOLIS (WISH) - There's a socialist running for a seat in the Indiana General Assembly and his name will be on the ballot in Hamilton County. John Strinka is a warehouse worker who collected more than 450 petition signatures, enough to get his name on the November ballot. As he delivered them to the state election division wearing his Socialist Party t-shirt, co-director Brad King said he's the first socialist candidate to qualify for the ballot in Indiana since the early '80's. 'I think it's a victory for American democracy,' says Strinka...."
"Today financial constraints, party politics and a strong media bias about allowing anyone beyond the 'chosen' two – the candidates of the Republican and Democratic parties – makes it nearly impossible for anyone to get recognition. Did you even know that there are at least 16 other announced presidential candidates for other political parties for the 2012 election, ranging from Stewart Alexander of the Socialist Party to Jack Fellure of the Prohibition Party (they’ve been running candidates for years, by the way)...."
Socialist Party presidential candidate Stewart Alexander was interviewed on the Wild Wild Left Show on Friday June 08. Alexander has already secured the Socialist Party's nomination but is hoping to gain a spot on the Peace and Freedom Party's ballot line in California....."
"Full-fledged U.S. socialists are relatively scarce these days – three socialist-oriented presidential candidates received about 21,000 votes among them in 2008. And current socialist leaders don't share the right-wing view that Obama is a fellow traveler. "It makes absolutely no sense," said Greg Pason, national secretary of the Socialist Party USA. Obama's health care overhaul "is anything but socialist. It's bailing out for-profit companies...."
The Socialist Party USA Presidential Candidate Stewart Alexander says that the most recent jobs report represents the bankruptcy of Obama’s economic policy. The report included an increase in the unemployment rate to 8.2% and indicates a lull in job creation for the first quarter. "J. Quinn Brisben, whose review appears in this issue of MR, died on April 17, 2012, at age 77. He ran as the Socialist Party USA candidate for President of the United States in the 1992 general election, and was a longtime activist and teacher. He was also a poet interested in cultural as well as political themes. In the 1990s he emerged as one of MR’s most treasured cultural and political reviewers, reviewing E.P. Thompson’s posthumous work on William Blake (MR, September 1994), Roxanne Dunbar Oritz’s Red Dirt (MR, December 1997), along with reviews of a number of other books...."